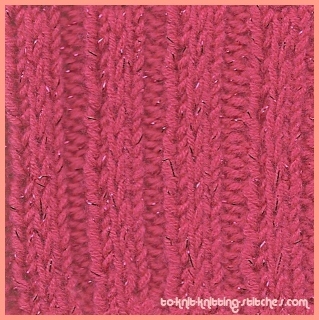 Ribbing (Rib) Knitting - What is it? 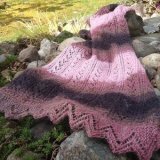 Ribbing Knitting or "Rib" is basically knitting in patterns using knit and purl alternately. You can choose 1x1 rib, 2x2 rib, 1x2 rib,2x3 rib and many others that you may come up with. The most preferable rib is 2x2 or True Rib and you'll be seeing a lot of it. Ribbing is use when you want to narrow the certain area of knitting to make it more elastic, narrower and better fit. Some of ribbing examples are cuffs of a sweater, the edge of a hat or a sweater, a waist band on a knitted skirt or pants. This is only for practice, so I will use only 10 stitches to save time. Begin casting on 10 stitches. Row 1 - *knit 2, purl 2*, repeat in *_* to the end. Row 2 - purl the purl stitches, knit the knit stitches to the end. Repeat these 2 rows until you feel comfortable about knitting the rib stitches then bind off. 1x1 Ribbing is done by making a pattern of k1, p1 on the right side and p1, k1 on the wrong side. This type of ribbing is used mostly in socks and neck band. See Picture Gallery For example of ribbing knitting on sweaters. 1x2 ribbing is done by making pattern of k1, p2 on the right side and p1, k2 on the wrong side. 2x3 ribbing is done by knitting a pattern of k2, p3 on the right side and p2, k3 on the wrong side. Tip: Pull yarn little more tighter than usual when change to purl to form a nice tight rib.